This is the beginnings of an idea about 3d numbers. We have the complex numbers, which are complete, and beyond this we have quaternions and some other constructs, but no 3d numbers. As I'll show, developing a 3d algebra requires moving to multi-valued quantities. So we have a 3d number a + bi + cj. Addition and subtraction are just element-wise. What about times and divide? Well, a times b at its core means apply b to a as b is to identity (which is 1 in the reals). Note that this definition works for reals, complex numbers, integers etc. So like in this diagram, let's say that a is 1+i and b is 1+0.1j. 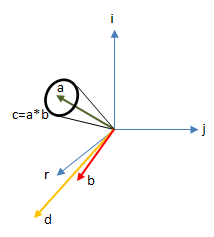 We take the identity to be 1, so b compared to 1 is a relative offset of one vector to another, defined by an angle and a scale, in this case an angle of about 0.1 radians and a scale of about 1.05 or something like that. So that describes how 'b is to identity'. 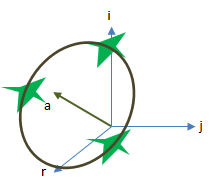 If we apply this relation onto vector a we have a problem, in what direction do we rotate away from a by this 0.1 radians? We have multiple answers, in fact b could sit anywhere in a circle around a, i.e. b maps out a cone around a, each b having a different phase phi. At this point we could either say 'well that's no good, a*b must give a single answer' and leave it there. Or, as in this blog, we continue to build the algebra with these multiple results as a feature of the algebra, not as a problem. So we have a multi-valued algebra where a*b is either a single value when b is a real number, or otherwise is the set of points on the circle of a cone. This starts to demonstrate that every multiplication makes the result less and less certain. So, generalising, we can say that a*b is a sort of convolution of b onto a. And, we see that every 3d number is generically described by a probability density function over the whole 3d space. Also notice that b*a is not the same result, so multiplication is not commutative in this algebra. In this system we find that addition and subtraction are a convolution of the many-valued quantities, since we're adding all combinations that a and b can be. Finally, what about divide? Well clearly you can divide in some cases, since it is just the opposite of the multiply. Statistically, we could generate the divide operator as c/b = a for all a and b where c=a*b. However, more work is needed to build a divide algorithm, and it doesn't seem that all numbers can be divided, but that isn't a hard requirement anyway. So we appear to have a basic many-valued algebra. You can make a similar algebra on the real or complex numbers by allowing dual valued square roots for example, but this 3d algebra has uncertainty at its core. Is there anything more to it than described so far? Problem 1: a+a is not the same as a*2 since + is a convolution. This is where the algebra gets more complicated. You see + is only a convolution if a and b are independent variables, if they aren't then + can act differently. 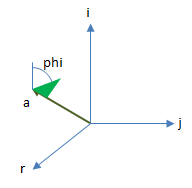 The way to calculate is to take the phase phi of all the independent variables in the equation as degrees of freedom, then allow each degree of freedom to vary when calculating the result. What we end up with in the general case is a path-integral formula, very similar to the maths of quantum mechanics. As a result, we get values which are coherent or in phase, e.g. 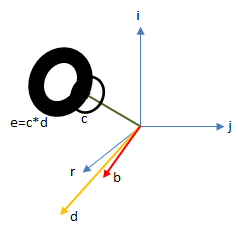 a and b where b=a, values which are out of phase, e.g. 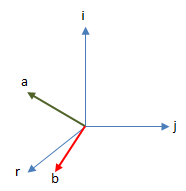 a and b where b=-a, and values that are independent, e.g. a and b. So a*a is not the same as a*b where b is independently the same value as a. Notice that the flags rotate twice around the full circle, since applying the twist phi twice in a*a. So even though both these pictures are the same probability density function, they will be different if and when they are applied in other operations. For example, if you apply the independent variable d to these circles, you get a thick circle in the a*b case, and something like a thin cardoid in the a*a case. In fact, we could continue to multiply a by a and get a growing double spiral probably. This roughly defines the power operator, and is much like a spreading wave. 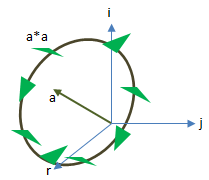 Problem 2: a is not the same as 1*a, since 1*a generates a circle around the vector 1+0i+0j. We need to distinguish between constants and variables here, we do this by prefixing constants with _. So _1*a = a, but 1*a is a superset of a, constants have phi = 0. So, getting back to the data structure, a single 3d number is not only a probability density function but also a set of independent degrees of freedom, with a density function for each one. I think. What is the use of such an algebra? Well it seems to have good links with quantum mechanics. It is interesting that the randomness is a sort of necessary result of extending into 3d.